Summary: Private investigator Cormoran Strike returns in a new mystery from Robert Galbraith, author of the #1 international bestseller The Cuckoo's Calling. 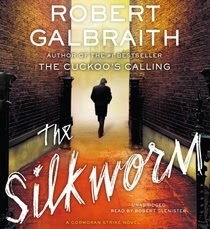 THE SILKWORM is another wonderful mystery, and I can honestly say that I love this series. The characters are wonderful (I adore Cormoran! ), as is the writing; and I truly appreciate the intricacies of the mystery. I have listened to both of the books in this series, and the audio books are spectacular -- although I am pretty certain that I'd love these books in any format! THE SILKWORM picks up soon after THE CUCKOO'S CALLING left off. Cormoran Strike has found a bit of fame after solving the Lula Landry murder, and therefore his business is doing better. One of his new customers is the wife of author Owen Quine. She comes to Strike and asks for his assistance in finding her husband who has been missing for a few days. Quine has been known to disappear in the past, but Strike quickly sees that something might be different this time around. After some snooping, Strike discovers that Quine has written a manuscript that has offended almost everyone he knows. While the novel is considered rubbish by many, if it were to be published, it would ruin many lives. Aha -- a motive! When Quine is brutally murdered in a scene not unlike one that occurs in the manuscript, Strike is desperate to discover who is behind his death. After a great deal of sleuthing (and with the help of his trusty assistant Robin), Strike races against time to not only find the guilty party but also to prove his client's innocence. I adored THE SILKWORM! The characters were very interesting -- I especially love Cormoran, Robin and the chemistry between the two! However, the secondary characters in this novel, namely those in contact with Quine, were pretty darn intriguing as well. There were many possible suspects and I can honestly say that my opinion of the guilty party changed many, many times. Because this novel is relatively long (over 450 pages and 1050 minutes), I felt extremely vested in the story. I tend to take forever to listen to an audio book and I certainly spent weeks with this one. In fact in most cases, I wouldn't have even started a book that was this long. Having said that, I can't really complain that the book dragged. I enjoyed Cormoran's many interrogations and how he whittled down the potential suspects. In addition, I was very impressed with how the story came together and Strike was able to figure it all out! As far as mysteries go, this was a doozy! I loved all of the twists and turns, and even though I eventually had a pretty good idea of who was guilty, I still didn't figure out all of the specific details. As far as I'm concerned, guessing the murderer doesn't really count if I don't understand the whys! One thing that stood out to me about THE SILKWORM was how it delved into some aspects of publishing... and it wasn't always pretty. Quine was writer who experience mediocre success (if you can even call it that), but there were also agents, editors, and publishers in this story who were both suspects and witnesses. The book definitely featured some of the less-glamorous sides of the industry and focused on the jealousies and pettiness of the players involved. I thought it all was interesting and rather funny. I absolutely loved the Cormoran Strike mysteries and can't recommend them enough. Personally, I love the audio book versions, but the important thing is to just get your hands on copies of them in any format! Thanks to the publisher for providing a review copy of this audiobook. I loved the first one audio and can't wait to listen to this. Glad the series continues to be good. I've been on the fence about this, but your review has swayed me to go ahead and add this series to my list. Thanks, Julie! I am absolutely besotted with this series, and at this point I will ONLY listen to the audio. They are that good.